A majestic camel tour along the Swan River through the date palms to the Bell Tower and Barrack Square alongside lizabeth Quay. 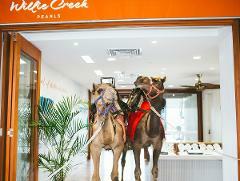 Hear the history of camels contribution to W.A. whilst we take some great photos of your ride to email to you. Two of Perth’s most unique experiences have combined to showcase the best of Broome in the city. Enjoy a guided tour along the Perth foreshore by camel back and witness the magic of a live pearl harvest.